Thorne Plumbing, Heating, and Air Conditioning knows that at some point, as a home owner, you will have to replace your furnace, and we want you to be able to make a knowledgeable, informed decision. At Thorne, we offer top quality Lennox products, including gas and oil furnaces and assistance with choosing which system is right for you. The purchase price is lower for an oil furnace than for a gas furnace, but efficiency is lower and fuel prices are higher. Oil furnace equipment gives off more heat per BTU than any other heat source, but with an oil furnace, you will need a storage tank and you must have oil delivered. Oil furnaces can be easily and regularly serviced by your delivery company (call your delivery company for more information), but due to soot and dirt build up, the maintenance is more extensive. Chimneys need to be cleaned and oil filters need changed often. Natural gas furnace units have a higher efficiency of heating and the fuel cost is less, and the only requirement is that your home must be in an area where there is a gas supply available. Gas furnace units require minimal maintenance, but gas gives off less heat per BTU than oil furnace units. Gas furnace units are generally quieter and cleaner than oil furnaces, but the price is higher. Thorne Plumbing, Heating, and Air Conditioning is here to help you make the best decision for your home heating. 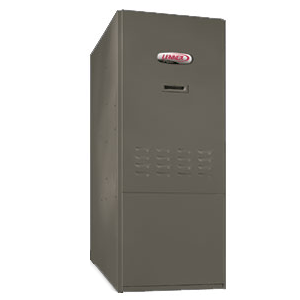 Our qualified professionals are ready to install your new Lennox oil or gas furnace today. Call us for more information or to schedule your appointment.